Attorney General Jeff Sessions told Chicago officers that the anti-police rhetoric of the ACLU, Black Lives Matter, and Antifa is partly responsible for the city’s spiralling murder rate. Like most American cities, Chicago’s murder rate steadily declined from the 1990s onwards, as violent crime in general receded. However, in 2016, the city experienced the biggest single-year increase in murders in 60 years – 765 people were shot, stabbed, or otherwise killed, up from an average of 454 one decade previously. As Chicago’s mostly black southside echoed with gunfire, the city recorded more homicides and shootings than Los Angeles and New York City combined. While crime had been slowly creeping upwards in the preceding years, it exploded in 2016. But what changed that year? In 2015, in the wake of a spate of police killings of young black men across the country, the American Civil Liberties Union issued a report on stop-and-frisk searches in Chicago. The practice, they argued, unfairly targeted the black community, and the organization threatened the city with a lawsuit. Sessions referred to a 2018 University of Utah study to prove his point. The study found that the near-total halt in stops was met with a 58-percent increase in homicides. This increase in crime cost the city $1.5 billion, and also disproportionately affected minorities – 78 percent of the city’s murder victims were black, while 94 percent were minorities. The researchers called the increase the ‘ACLU effect’. 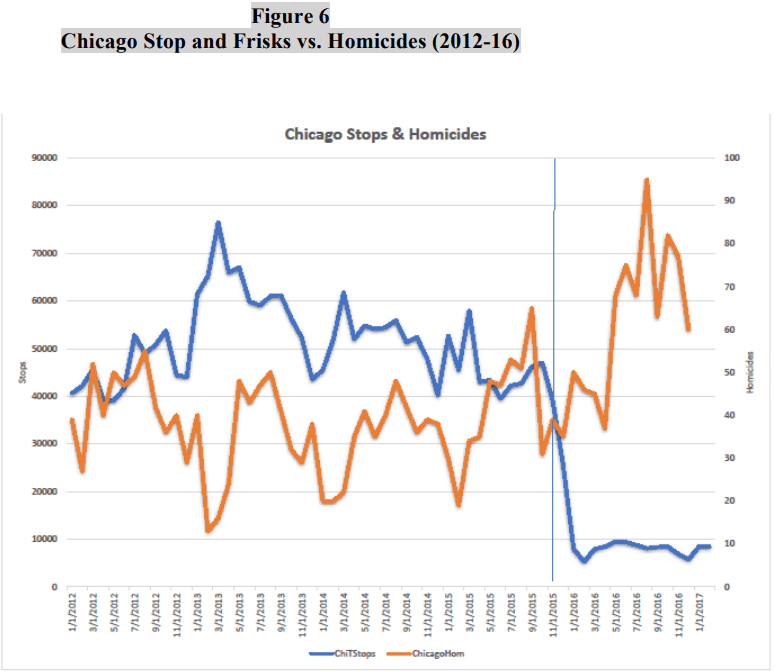 While the Utah study and Fardon’s testimony are damning, a 2017 report from Sessions’ own Department of Justice found that the reasons for Chicago’s murder spike were “broadly debated and inarguably complex.” In addition to the consent decree, it found that a lack of adequate training for officers policing the streets, and a lack of systems to punish officers who break the law, were also responsible for the force’s ineffectiveness at getting the murder rate in check. Sessions, however, drew attention to New York City’s tough policing policies, credited with reducing the city’s murder rate from 2,605 in 1990 to 292 last year; and to Los Angeles, where the murder rate fell by half between 2005 and 2013. “The proof is in,” Sessions said on Wednesday. “It can no longer be denied: disrespect and lack of support for police officers has real world consequences.” As Sessions was speaking, four people – including a 13-year-old girl and a six-month-old baby – were shot when a masked gunman opened fire on a vehicle in Chicago’s South Loop neighborhood. “If the city refuses to include these demands in the decree, this most recent effort to address police violence and racism could fail like every effort that has come before it,” Jonathon Projansky of Black Lives Matter Chicago told reporters at the time. The Chicago Fraternal Order of Police responded by saying that the weekend murder-fest could be “a hint of what’s to come” if BLM’s “war on police” continues.